Close the air vent when heating the vehicle. At high outside temperatures, open the air vent and activate the "cooling with air dehumidification" function. Otherwise, temperature-sensitive items stored in the glove box could be damaged. When automatic climate control is activated, the glove box can be ventilated, for instance to cool its contents. The level of airflow depends on the airflow and air distribution settings. 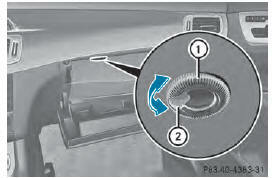 ■ To open/close: turn thumbwheel 1 clockwise or counter-clockwise.